Smartsheet‘s Forms allow a date to be selected when building the Form. 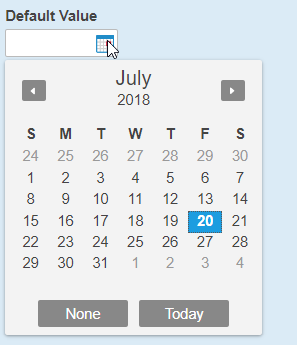 Unfortunately, that [Today] button only selects today’s date, not setting the default to whatever date the form is used. This has never really been a major problem for me. Once the form is submitted, I captured the row’s creation date, in effect capturing “today”. Based on the number of posts in the Smartsheet Community, however, I may be in the minority and that’s not always what is needed. What is needed is that the date DEFAULTS to the date it is viewed, but can be changed by the user of the Form. All of the other column types can have a default value, changeable by the end user. I don’t know why Smartsheet’s dates don’t. 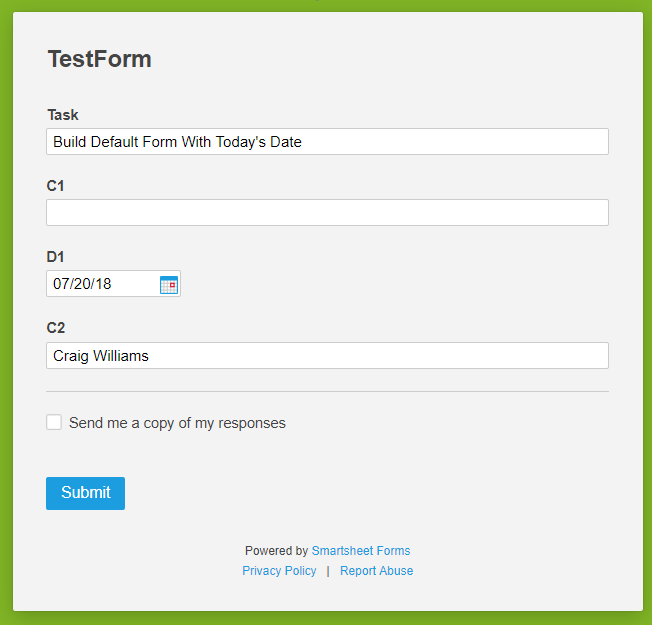 So here’s today’s task – get the [D1] column shown in this form to be dynamic and populated when the Form is open. 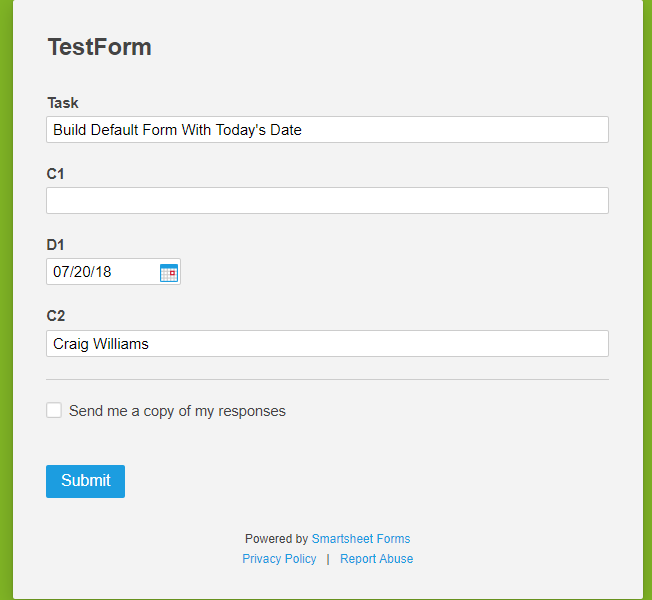 In the image above, the [Task] and [C2] columns are also filled in when the user opens the Form, but are not using the default value for the form builder. There’s lot of possibilities there that I won’t dive into in this post. 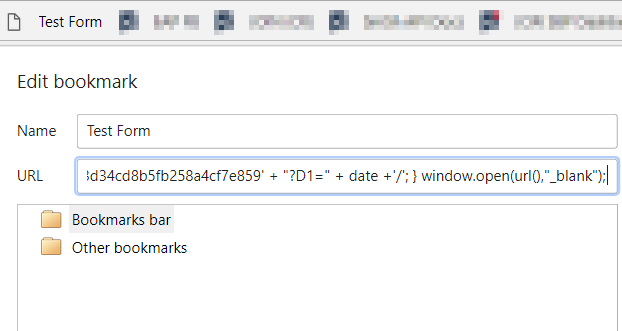 This is NOT a URL, so unfortunately, you can’t just copy it into your browser’s address bar, but instead it is the URL/Location in a saved Bookmark. I tried both Chrome and Firefox successfully. I have a few bookmarks in my Chrome browser that open various Forms, so this fits right there if I need it. The main drawback I see is that we can’t go to each user’s browser and set them up with a new bookmark. Well, maybe we can, but I don’t know how and don’t want to even if I did. The second method uses a cell in a Smartsheet Sheet to build the URL directly. Dashboards can be shared to users that can’t see the Sheet or access the Report directly and because it is showing a Report (other Dashboard Widgets did not yield satisfactory results), it could show multiple Forms across the Smartsheet system. I can see a few new uses for that too. If you like this post, please “Like” it. Every time my post gets liked, a child gets an ice cream cone. Or I’m more likely to post another one. It is one of those two, I’m sure.